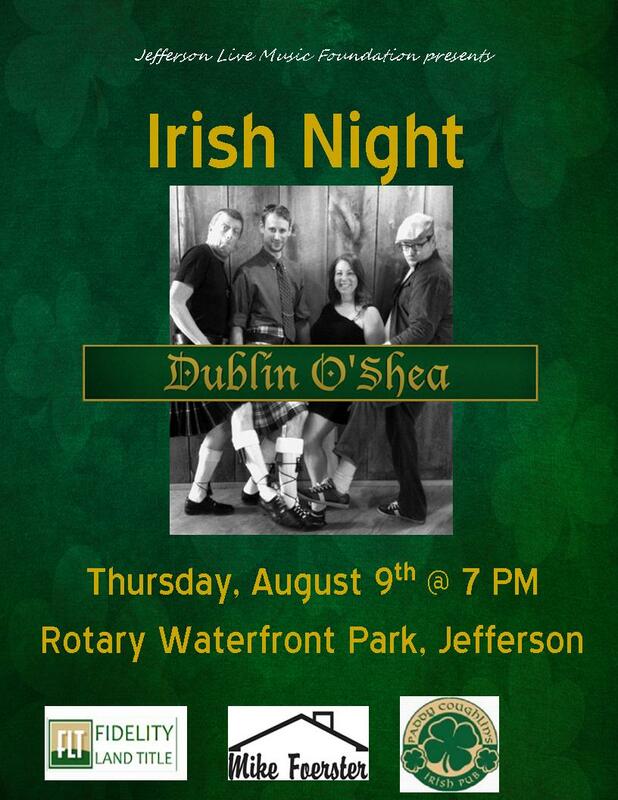 On Thursday, Aug 9th at 7PM the Jefferson Live Music Foundation will present “Irish Night”, one of the 2018 Concerts at Rotary Park season free concerts featuring Dublin O’Shea at Rotary Waterfront Park in downtown Jefferson. Dublin O’Shea is a Milwaukee group formed in 2002 dedicated to preserving Celtic folk music. Specializing primarily in pub songs from Ireland, Scotland and the Nautical Tradition, they offer a well-rounded look at the Celtic experience. With a repertoire stretching from 300-year-old sea tunes to contemporary songs, Dublin O’Shea takes a freewheeling and fun-loving approach to their music. 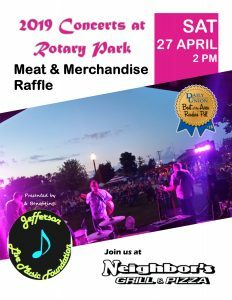 This free concert presented by the Jefferson Live Music Foundation to be held at the beautiful Rotary Waterfront Park located along the Rock River in downtown Jefferson. In addition to concert sponsors Fidelity Land Title, Mike Foerster Real Estate and Paddy’s Irish Pub season sponsors include: River’s Edge Meat Market, Bon Ton Bakery, Johnsonville, Malicki’s Piggly Wiggly, Jefferson Caseys, The Corner, Daily Jefferson County Union and WSJY-WFAW-WKCH aid the Jefferson Live Music Foundation’s mission of providing free, quality entertainment for the whole family. Food and beverages will be available for purchase. This week Scouts will be benefiting from the sales in concessions and Paddy’s Paws will benefit from beverage sales. Staff members from the Jefferson School District will be manning the grill all summer long. Stop down and show them your support! admin August 6, 2018 . No Comments on Irish Night Concert. Categories: Uncategorized.